Lock in a great price for Belambra Clubs Hôtel Les Deux Alpes - L'Orée Des Pistes – rated 8.5 by recent guests! Location was just amazing. Right on the piste, next door to ESF and Bruno Sports conveniently located under the hotel. Could not be better, especially when we had two small kids with ESF lessons. We had half board conditions and the food was excellent, with different specific in every day on every day: french, american, marocan, italian etc. Great for the ski lifts. Food was very good at lunch and dinner, and simpler at breakfast. The location and dinner were great. Every evening a different speciality (Indian, Oriental, French, etc.) and lots of variety in the dinner buffet. The location is very central next to the Jandri Express Lift for going all the way to the gletsjer. The price had also been very ok. The personnel was very friendly and helpfull too. The balcony was very comfortable. Some rooms do not have a balcony, so if you want one, please check which rooms have one. The hotel looked modern and remodeled from the outside. It also has a nice sun terrace with lounge chairs. Hotel position great , food good, staff helpful and overall good stay. Fantastic location right on the piste, friendly staff & great selection of food with free wine. Excellent location right on the slopes. Very good and helpfull staff. always available but with know how not to bother customers. Very clean room and cleaning personnel.4 stars breakfast and very good dinner. petit déjeuner copieux et bon. sauf les oeufs brouillés très secs pas moelleux du tout. Par contre grosse erreur sur votre page de description de cet hotel : IL N'Y A PAS DE PARKING GRATUIT et PAS DE PARKING DU TOUT. Il y a bien un petit parking sur la place centrale mais avec horodateur ou disque bleus pour 1h30. faut se garer ou l'on peut dans une rue. RESULTAT : en 4 jours pourtant bien garés à notre avis on a pris une amende !!! Отличное расположение отеля в самом центре деревни в нескольких шагах от центрального подъемника, радушный персонал и насколько это это возможно хорошая (в рамках недорого клубного отеля) еда. Ottimo il buffet, personale gentilissimo, disponibile e amichevole. Ci tornerò e lo consiglierò di certo. Posizione top. One of our top picks in Les Deux Alpes.Set in Les Deux Alpes ski resort, near the Jandri Express cable car, this chalet style hotel offers ski-to-door access, a sun terrace and a restaurant overlooking the mountains. Belambra Clubs Hôtel Les Deux Alpes - L'Orée Des Pistes provides heated, rooms with attached bathroom, all easily accessible by elevator. Some of them feature a balcony with views of the ski tracks. The restaurant serves regional cuisine and daily breakfast. During the day, the bar offers snacks and drinks that can be enjoyed on the terrace with daily newspapers. During ski season, it turns into a lounge bar with evening entertainment. Belambra Clubs Hôtel Les Deux Alpes - L'Orée Des Pistes provides many on-site services to help you organize your holidays: ski storage, tourist guide, ski pass vending and ski equipment rental. There is also a kid’s club and a game room with table football and a pool table. WiFi access is available at an extra cost and a free public parking is also possible nearby. Guests can also have a free access to the station's swimming pool. This property also has one of the top-rated locations in Les Deux Alpes! Guests are happier about it compared to other properties in the area. This property is also rated for the best value in Les Deux Alpes! Guests are getting more for their money when compared to other properties in this city. When would you like to stay at Belambra Clubs Hôtel Les Deux Alpes - L'Orée Des Pistes? All rooms are heated and include an private bathroom. 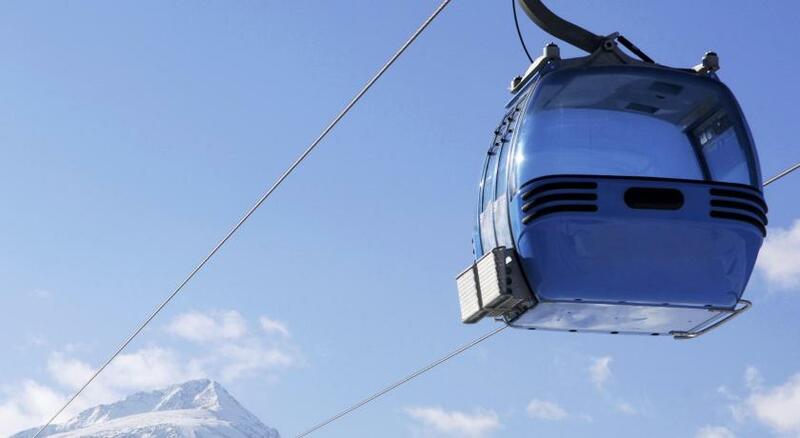 The best location for the resort: Ride to the top of the slopes with the cable car just outside the hotel! The mountains have never been as close. You can even ski on Europe's largest glacier at 3,600 m and take advantage of the numerous activities available in the resort! House Rules Belambra Clubs Hôtel Les Deux Alpes - L'Orée Des Pistes takes special requests – add in the next step! Belambra Clubs Hôtel Les Deux Alpes - L&#39;Orée Des Pistes accepts these cards and reserves the right to temporarily hold an amount prior to arrival. Belambra Clubs Hôtel Les Deux Alpes - L'Orée Des Pistes accepts these cards and reserves the right to temporarily hold an amount prior to arrival. Please note that the kid's club is only open from 11 July until 22 August. Not all rooms have a bath although pictures suggest this. The room we were given needed renovating. Charged twice for city tax although it had been prepaid and receipt was shown. Dinner quality could be more consistent as sometimes we had great food, but some nights were not at par. Breakfast could have been better as well. Lunchtime the brasserie gets very busy, but there is nothing to be done about it. The cleanliness of the room could be better. The carpet was wornout and dusty. The toilet had a strange odor. The walls had some tiny stains of blood. The size of rooms could be bigger. We went in summer, but if you come in winter with your ski gear, the room is quite small. Room was tired and ski locker room much too small for number of guests, this was at a quiet time, dread to think how busy it gets at peak season. Ski lockers too cold so the ski boots would not dry from one day to the other.